Global friction modifiers market expected to reach USD 1,048 million in 2023, growing at a CAGR of 3.40% between 2018 and 2023. Friction modifiers are fuel additives that are generally used in boundary lubricant applications to improve the lubricity as well as energy efficiency. The report of friction modifiers market provides the comprehensive glance on the global and regional level. The study provides historic data of 2015 to 2017 along with a forecast from 2018 to 2023 based on revenue and volume. The study includes major driving forces and restraints for the friction modifiers market along with the impact they have on the demand over the forecast period. Furthermore, the study also provides the major avenues of global friction modifiers market. The global friction modifiers market study also comprises the detailed value chain analysis for providing a comprehensive view on the market. Moreover, the study also includes Porter’s Five Forces model for friction modifiers, to understand the competitive landscape of the global market. The study includes a market attractiveness analysis of all the segments related to the market. The study provides a significant view on the global friction modifiers market by classifying it into type, application and region segmentation. These segments have been estimated and forecasted with the future and past trends. On the basis of type segment, the report has been segmented into organic and inorganic friction modifiers. The key applications in the report have been segmented into transport lubricants and industrial lubricants. Transport lubricants further segmented into commercial vehicles, passenger vehicles, aviation, and marine. The regional segmentation includes Middle East & Africa, Asia Pacific, Europe, Latin America and North America. Furthermore, it is bifurcated into major countries such as U.S., UK, Germany, France, China, Japan, India, and Brazil. 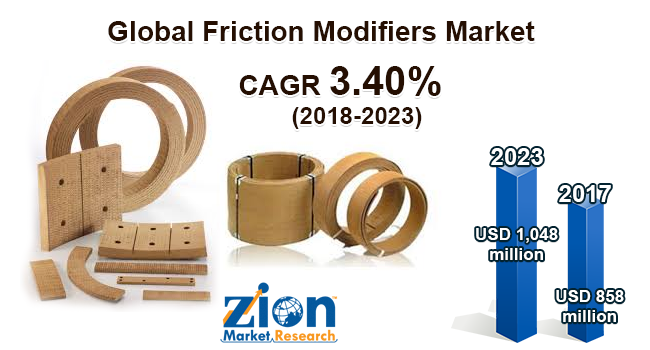 Major vendors of global friction modifiers market include Lubrizol, BASF SE, Afton Chemical Corporation, AkzoNobel N.V., Vanderbilt Chemicals, LLC, Infineum, Croda International Plc, Evonik Industries, Chevron Oronite Company LLC and Archoil among others.